I hope you liked the video. The A to D findings were intended to discuss here. Now to the limits of Volume Control. In a conventional theremin the volume dynamics are limited by the speed of the hand movement. So let us count. The hand movement of 30 cm to the volume antenna then means 30 Milliseconds. The attack time of a plucked string is between 3 - 5 ms. No chance, mate. What can we do? 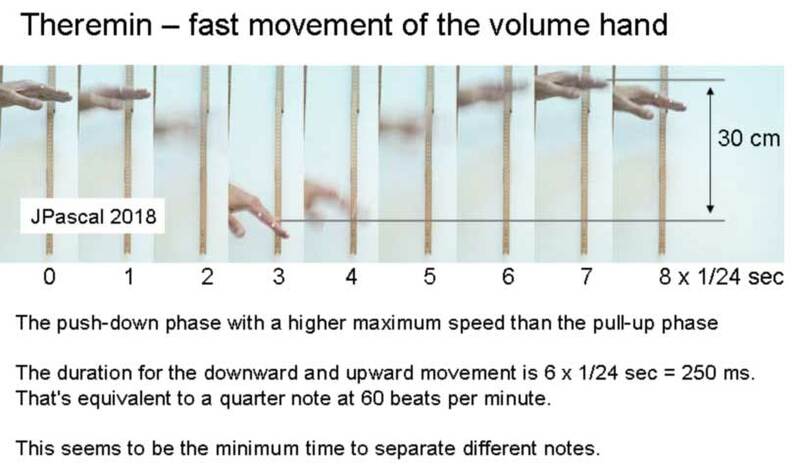 You basically sense velocity, give it some extra gain, and mix it into the volume. A sharp knee threshold doesn't hurt either as it further magnifies the velocity gain. O.k. some solutions are mentioned and best solutions shown in practice. But I goes on step by step. A self-experiment with smartphone camera to observe the movement of the hand. The hand looks like a hungry fish with the two eye marks that I wanted to use for measurements. But the camera is too slow. Now I can go on with volume control experiments respective experience. Here is a simple block diagram für the volume control unit. There are some essential parameters which mainly influence the signal envelope by volume control. In practice mostly two knobs are remaining: Offset and output volume pegel. But I also saw an additional "attack" knob at a theremin. I want to do experiments within the parameters above and additionally integrated functions. Volume Control unit is checked with input of radio sound and output to a guitar amplifier. Loudness is performed touchless via open loop antenna and voltage controlled attenuator VCA with jFETs. The radio used just happened to be playing a suitable song while testing. Fortuity? Using a sweep generator and my old russian oscilloscope the filter curve can be obtained. Change of volume oscillator frequency leads to some volts difference usable for laudness control. Two parameters now must be in consideration: Null position and increase the bandwith of the filter. I like your volume approach and the note plucking effect. To be honest I have never been happy with my own PWM approach though it works perfect or better. In all of my theremin designs I furnished an iron on PDF so others could reproduce my PCB easily. 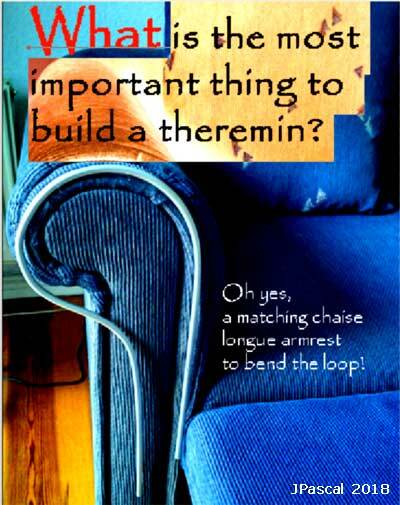 There is a need for a do-it-yourself stand alone volume control design for all those pitch only theremins out there. It would be very useful if you could fulfill this need. Researchers like yourself are becoming far and few in today's world of instant gratification. I am also guilty. thanks, I will do my best. I'm sure the volume unit of a better theremin is the bigger challenge of all. A "walking bass" is not so a problem, but the attack and decay periods as with real instruments. And the appropriate dependence of the sound spectrum on the laudness.